Anacortes, WA. This is where The Lonely Forest is from, and they are damn proud of this. Most critics would consider them a Seattle band… or a Northwest band if they wanted to be even more general, but the boys from The Lonely Forest are definitively from a town about 75 miles north of Seattle. Their love for their hometown is not only a part of them, but a big part of what makes their music so genuine as well. 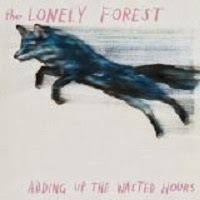 The Lonely Forest is a quartet comprised of John Van Deusen (guitar/vocals), Eric Sturgeon (bass guitar), Braydn Krueger (drums), and Tony Ruland (guitar). Adding Up the Wasted Hours is the bands fourth album, and it was produced by Death Cab for Cutie’s Chris Walla. This pairing seems to be an excellent fit for the band given their affinity for making indie rock tunes while wearing their hearts on their sleeve, much like Death Cab. I was turned on to The Lonely Forest by my now wife after moving to Seattle back in 2010. They seemed quite young when we saw them and had already been at it for five years. They were also getting ready to release their third album, Arrows. Arrows is an excellent album and grew on me greatly as I listened to it, and I highly recommend it to anyone that does not have it. Adding Up the Wasted Hoursprogresses nicely from where Arrows left off. For lack of a better term, it’s still rather “emo” lyrically. The songs are personal and honest, and that continues to be a large part of the bands charm. Van Deusen comes off as relatable to many of us and if you connect with him it’s hard not to root for this band. Songs like “Lovric’s” and “Last Time (I Said Your Name)” make this very easy. I still prefer Arrows to Adding Up the Wasted Hours however. There were more moments when the band really rocked out on it, where this one stays a bit more pop. Van Duesen has a scream that I love, but it is underused in the band’s catalog, and is nonexistent on this album. The closest they come is on “Fire-Breather”. The Lonely Forest replaces the rocking moments with experimental growth though. Tracks like “Neon Never Changes” and “Stars Like Dust” work and provide an interesting sense of direction for their next release. I just hope that we get some of the heavier moments back next time as well.